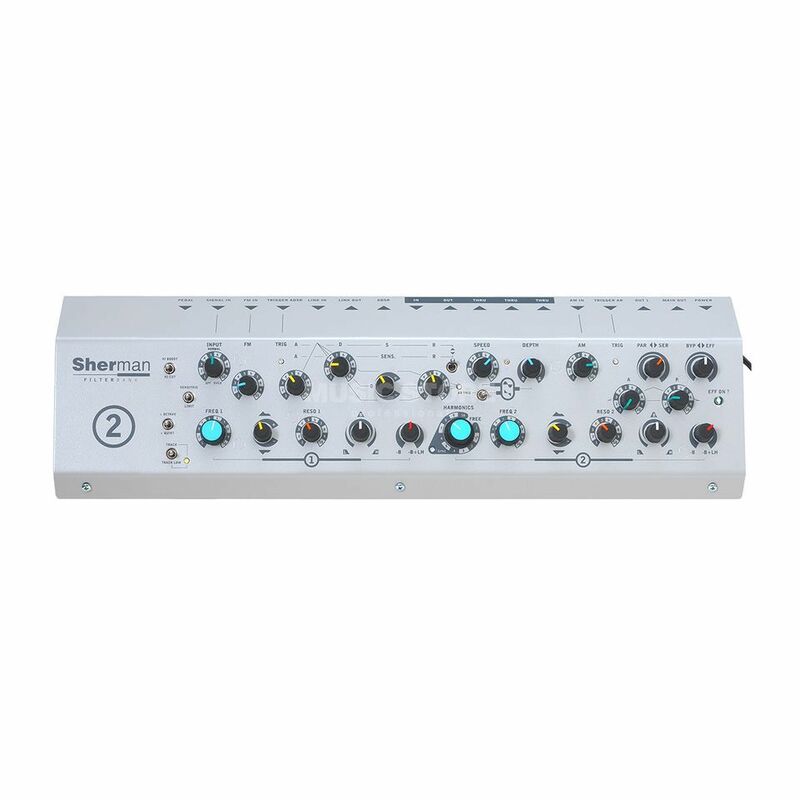 The Sherman FILTERBANK MK2 Dual Analogue Filterbank. The universal tool that turns your set-up into an inspiring laboratory. The Sherman FILTERBANK MK2 is a powerful analog filtering and distortion unit with a huge frequency range and a killing TUBE overdrive behavior. Easy and FUN to use, live and in the studio. The Sherman Filterbank feels at home in various surroundings. if you’re lucky enough to posses a modular system, the Sherman will be your favourite module. it is patchable at any point in your modular chain, and will provide simply exquisite filtered and overdriven sound. Connections may also include trigger and voltage signals in both directions. Wipe the dust off your old FM synth, as the Sherman Filterbank MK2 generates nice results with this type of signal. Even a simple sawtooth will be enough to discover new, amazing sounds at the turn of a knob. the Sherman Filterbank is an analog synthesiser with no competition in its price class. In any studio it ‘s the most inspiring effect unit of all. From precise equalizing on critical tracks, to brain-frying filter sweeps, you always have total control. The knobs have different colors to guide you quickly. get a hand-on feel and just keep kicking the sonic energy in this pure analog machine, over and over again. No wonder many engineers became real Sherman Filterbank addicts. Guitar & Bass players will discover a whole new dimension in the creation of their personal sound, what’s more, without giving up their familiar way of performing, they will find an updated place in today’s sound world. The input sensitivity is a perfect line level adjuster up to the middle position. There, it becomes more sensitive, up to overdrive with microphone level. Plug in a mike, and enjoy processing any acoustic sound source. Drums & Percussion can trigger the ADSR and AR generators, or apply their dynamics via the envelope follower to e.g. a string pad passing through the filterbank. In the meantime, midi out will send out the acoustic triggering in a very accurately timed way, for later re-use or for direct triggering of another filterbank. Simple but more useful in practice than you might think. Not happy with the internal filter sound of your s-s-sampler ? The Sherman Filterbank MK2 is the cure, providing the nice velvet feel of a rotating knob for each parameter included. It really expands the sound of my Vermona Drm1. I make noisy industrial based beats so it fits oh so wonderfully. No regrets so far. I am still discovering it's potential as it has a lot of sweet spots, but you need to fairly dig in it to find them. Patience is key and I'm sure that this will stay in my studio for a decent amount of time due to its immense flexibility.